Advances in forensic odontology have led to improvements in dental identification for individual cases as well as in disaster victim identification (DVI). New and updated technologies mean advances in bitemark analysis and age estimation. Growth in the field has strengthened missing persons’ networks leading to more and faster identifications of unidentified individuals. 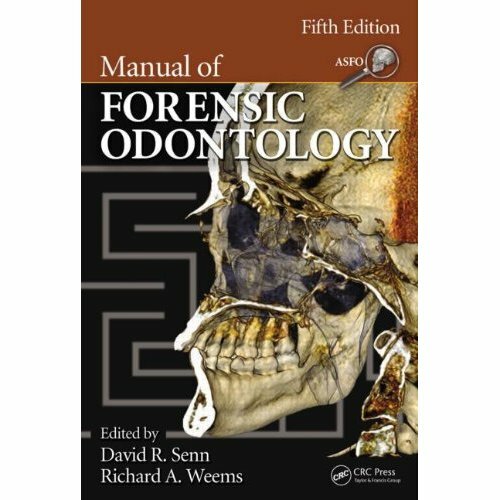 A product of the American Society of Forensic Odontology, the Manual of Forensic Odontology, Fifth Edition provides comprehensive and up-to-date information involving all facets of forensic dentistry and explores critical issues relating to the scientific principles supporting the field’s evaluations and conclusions. The manual has been an important source of forensic dentistry information for more than 20 years. This new edition is edited by a past president of the American Board of Forensic Odontology and a past Chair of the Odontology Section of the American Academy of Forensic Sciences. Expanded and enhanced with extensive color illustrations, this volume is designed to provide essential information based on sound scientific principles for experienced forensic odontologists and for those new to the discipline.